It’s Marathon Weekend, and whether you’re a runner or a spectator, you’re sure to enjoy the 2019 Boston Marathon Expo. With more than 200 exhibitors, the Boston Marathon Expo is recognized as the running industry’s premier expo for new products and services. Free. 11 a.m. to 6 p.m., John B. Hynes Convention Center, 900 Boylston St., Boston. The circus is in town all through School Vacation Week. Catch the Big Apple Circus with performances all week long at the North Shore Mall in Peabody. Tickets start at $35. Performances at 11 a.m. (an autism friendly performance) and 7 p.m. North Shore Mall, 210 Andover St., Peabody. Combining music, technology and comedy, Blue Man Group creates a form of entertainment that can’t be defined, but appeals to people of all ages. Described as “innovative,” “energetic” and “wildly entertaining,” the best way to truly understand what Blue Man Group is, is to see the show yourself. Tickets start at $66. Performances today at 1:30 p.m. and 7:30 p.m., Charles Playhouse, 74 Warrenton St., Boston. The Revere Spring Carnival returns through April 14, featuring rides, games and food. 6-10 p.m., Showcase Cinemas, Rte. 60, Revere. You don’t want to miss this musical experience – a sensory journey of innovation, artistry and imagination set to the soundtrack of one of music’s greatest icons. Using the cutting-edge capabilities of the Planetarium, The Prince Experience redefines nightlife in Boston, fusing the sounds of one of pop history's most beloved artists with stunning, inventive visuals under the Charles Hayden Planetarium dome. For ages 18+. 7:30 p.m., Museum of Science, Boston, 1 Science Park, Boston. Broadway in Boston brings the streetwise “A Bronx Tale” to the stage at the Boston Opera House. Tickets start at $ 40. 8 p.m. Citizens Bank Opera House 539 Washington St., Boston. It’s Marathon Weekend, and whether you’re a runner or a spectator, you’re sure to enjoy the 2019 Boston Marathon Expo. With more than 200 exhibitors, the Boston Marathon Expo is recognized as the running industry’s premier expo for new products and services. Free. 9 a.m. to 6 p.m., John B. Hynes Convention Center, 900 Boylston St., Boston. Head to Milton’s Cunningham park for the 20th Annual Easter Egg Festival. Enjoy pictures with the Easter Bunny, face painting, egg decorating and an egg hunt (weather permitting). For ages 2-6. $5 per child or $10 per family. 9-11 a.m. Cunningham Park, 75 Edge Hill Road, Milton. Earn your Junior Ranger badge today at Junior Ranger Day at Minute Man National Historical Park. Pick up your very own Junior Ranger Booklet. This is a fun way to learn and explore Minute Man National Historical Park while completing the pages in the booklet. When you are finished, show your work to a Ranger to earn your new badge. 9 a.m. to 5 p.m. Receive your badge and take your oath at 11 a.m., Noon, 1 p.m., 3 p.m. and 4:30 p.m. Recommended for ages 4 and up. Minute Man Visitor Center, Rte. 2A, Lexington. 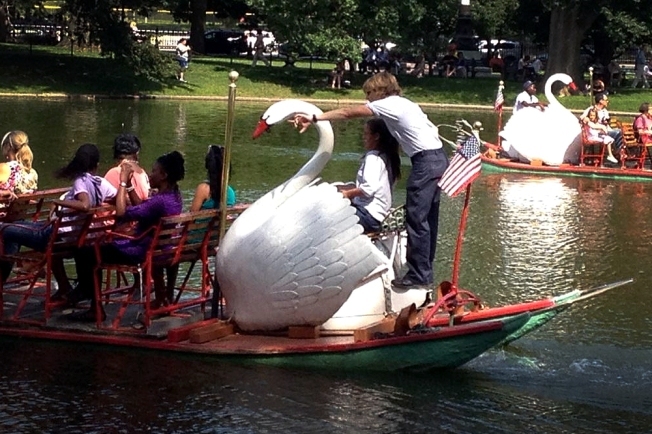 Celebrate spring with the return of the Swan Boats opening today at 10 a.m. Head on down to the Boston Common for this annual tradition. The Swan Boats are open daily weather permitting from 10 a.m. to 4 p.m. Tickets are $4 for adults, $2.50 for children 2 to 15 (free for children under 2) and $3.50 for seniors. The circus is in town all through School Vacation Week. Catch the Big Apple Circus with performances all week long at the North Shore Mall in Peabody. Tickets start at $35. Performances today at 11 a.m., 3 p.m. and 7 p.m. North Shore Mall, 210 Andover St., Peabody. Combining music, technology and comedy, Blue Man Group creates a form of entertainment that can’t be defined, but appeals to people of all ages. Described as “innovative,” “energetic” and “wildly entertaining,” the best way to truly understand what Blue Man Group is, is to see the show yourself. Tickets start at $49. Performances today at 11 a.m., 2 p.m., 5 p.m. and 8 p.m., Charles Playhouse, 74 Warrenton St., Boston. Watch as a procession of civilian evacuees fleeing their homes before the fighting begins, followed immediately by a battle demonstration as hundreds of British and colonial reenactors engage in a tactical weapons’ demonstration with musket firing and fast-paced battle action along a stretch of the actual Battle Road of 1775. Park staff will be on hand to direct you to parking and viewing areas. 12:45 p.m., Battle Road Trail behind Minute Man Visitor Center, Lexington. The Revere Spring Carnival returns through April 14, featuring rides, games and food. 1-10 p.m., Showcase Cinemas, Rte. 60, Revere. Broadway in Boston brings the streetwise “A Bronx Tale” to the stage at the Boston Opera House. Tickets start at $ 40. Performances today at 2 p.m. and 8 p.m. Citizens Bank Opera House 539 Washington St., Boston. Enjoy brunch at the Harpoon Beer Hall featuring their new brunch pretzels. Made to order andon a first-come, first-served basis, $10 gets you one brunch pretzel with two dipping sauces. 11 a.m. to 1 p.m., Harpoon Brewery, 306 Northern Ave., Boston. Celebrate spring and have some fun at this Annual Egg Hunt and Spring Celebration in Jamaica Plain. Enjoy some ice cream, activities, snacks and a photo with the Easter Bunny before joining your group for the egg hung and be sure to swing by Eliot School of Fine & Applied Arts at 10:30 for their egg decorating event. 12:30 p.m. to 2:30 p.m. Loring Greenough House, 12 South St., Boston. This Patriots’ Day weekend, visit the home of Colonel James Barrett and his family to learn about the intense military preparations that took place in and around the home in the weeks leading up to the outbreak of war (April 19, 1775). Help make cartridges for the minute men. Keep watch for British soldiers and help hide the military supplies before they arrive. 1-4 p.m. (British soldiers arrive at approximately 3 p.m.) Colonel James Barrett House, 448 Barrett's Mill Road,Concord. Broadway in Boston brings the streetwise “A Bronx Tale” to the stage at the Boston Opera House. Tickets start at $ 40. Performances today at 1 p.m. and 6:30 p.m. Citizens Bank Opera House 539 Washington St., Boston. Combining music, technology and comedy, Blue Man Group creates a form of entertainment that can’t be defined, but appeals to people of all ages. Described as “innovative,” “energetic” and “wildly entertaining,” the best way to truly understand what Blue Man Group is, is to see the show yourself. Tickets start at $66. Performances today at 2 p.m. and 5 p.m., Charles Playhouse, 74 Warrenton St., Boston. The Boston Public Market, 100 Hanover St., Boston.